Grand Canyon University supports initiatives that provide legal clarity for DACA students. There are 300-400 DACA students currently on our campus and we will continue to support and embrace them as they pursue their education and build a better future for themselves and their families. 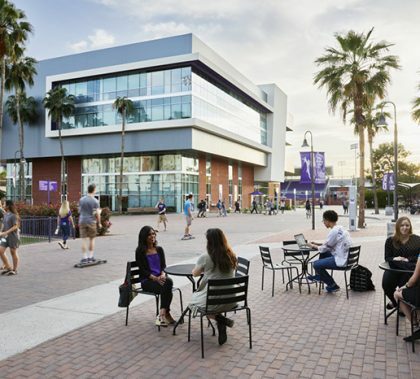 Home to more than 130 international students representing more than 46 countries, Grand Canyon University has a diverse student population worth celebrating. Beginning Monday, November 14, the Center for International Education is collaborating with both ASGCU and the International Student Club to celebrate the diverse GCU campus with International Education Week. Students are invited to a different event each day of the week. Chinese New Year is celebrated with lots of food, games, music and picking of the Hóng Bāo or red envelope with a lucky coin. The International Student Club enjoyed all of the above and more during their February 7 celebration of the Chinese New Year. GCU International Education Week included a host of events leading up to India and Nepal Night on Friday. The club transformed the Canyon Café into a cultural hotspot of India and Nepal. The International Student club is hosting another movie night on Friday, November 5, featuring Slumdog Millionaire. The International Student Club is hosting “Africa Night” on Friday, October 22 at 7 p.m. in the Canyon Cafe. The event features African food, music and the African students will dress in their native attire. A photographer will be on hand to take pictures of anyone who would like to pose in front of an authentic African backdrop. There is no charge for photos, but the club will be taking donations from anyone who wants to help the club with future activities. For more information, contact International Student Coordinator Debi Parris at 602.639.6351 or dparris@gcu.edu. With documentation covered, a group of students has formed the International Student Club to help those from around the world connect with their new school and home.